Would you agree that songs of praise coming from the small children is genuine? It’s not just their adorable faces and cute voices, but they genuinely have an innocent and pure heart. A hymn of praise from their mouth is like a breath of fresh air to those who are struggling and broken. It is like a wonderful melody that somehow soothes their pain. This 2-year-old boy released that breath of fresh air on his congregation. He offered a very sweet song titled “10,000 Reasons” to the people of God. His beautiful rendition of the song melted their hearts. He also used a tiny guitar while singing and even though he wasn’t really playing it, you can see in the video that he is trying his best to “strum” it. His talent at such a young age is truly a wonderful gift from God and in return, he offers it back to God. We can’t wait to see this young boy grow up into a man who will expand the kingdom of God! Indeed, what is written in Proverbs is a living word. If we teach the little ones in the way they should go, they will not depart from it. 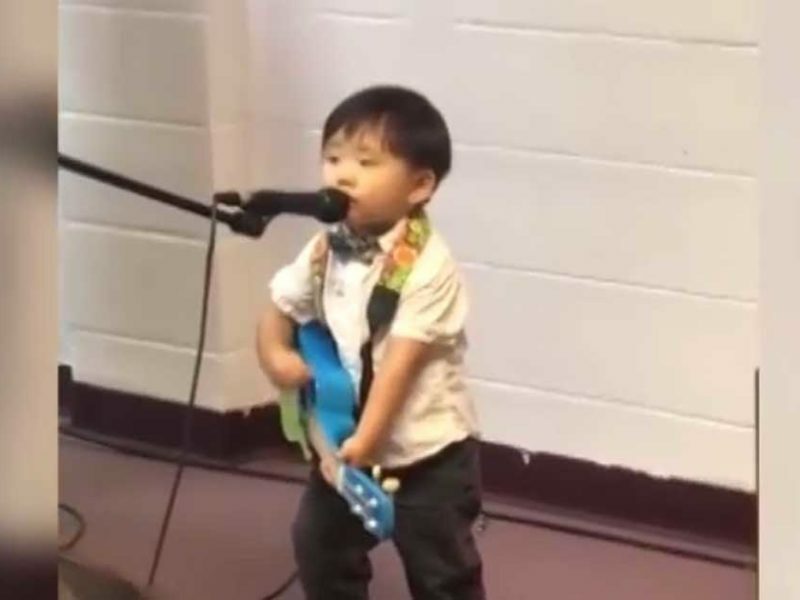 His parents sure set a good example for this little guy. They were able to train and support him fully.